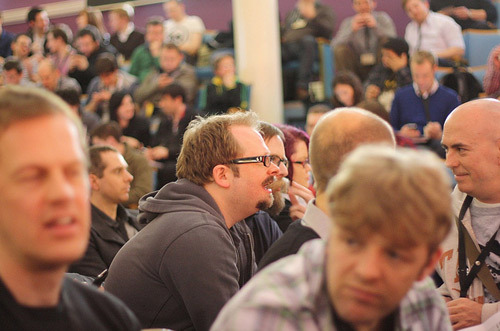 After six months of planning and an ever-increasing buzz, the day finally came when 650 web designers descended on Nottingham for the very first New Adventures event. I’m still exhausted and frantically evaluating it all, but now seems like a good time to sum up the highs and the lows of this bold new adventure. This week I have already written about the New Adventures newspaper (which is available as a PDF or printed copy) and also walked through the approach to the visual identity. So, to conclude my New Adventures posts for the week, here’s a recap of what happened as I saw it, and from the viewpoint of our attendees. I say a recap, but this is more of a whirlwind diary entry. I still can’t really get my head around it all, and I need to sieve it down in my noggin for a few weeks. Still, let me have a go whilst my emotions are good and true. The event sold out months ago, and we could easily have sold another 300 tickets. Great, but I think this created a slow build-up of pressure that didn’t really hit me until the day before. Throughout Wednesday’s many hours of setup I was excited but nervous. During the speakers’ meal I couldn’t focus, and by the time I got to the Erskine Bowling warmup I was dead on my feet, drinking soft drinks, and already fearful of oversleeping the next morning. I needn’t have worried, as I was up with the larks Thursday morning, but still with plenty to do. As we set about the final prep, volunteer briefings, and last-minute exhibitor support, it suddenly dawned on me: hundreds of you were about to descend on the venue, and there was no chance to change anything. This was it. Massive, massive gulp. Thankfully, most of it went to plan, and I even remember enjoying myself once or twice. I won’t say I underestimated just how much goes in to an ambitious event like this, and let me be clear—your head would explode if I listed all the details, requirements and legalities involved. 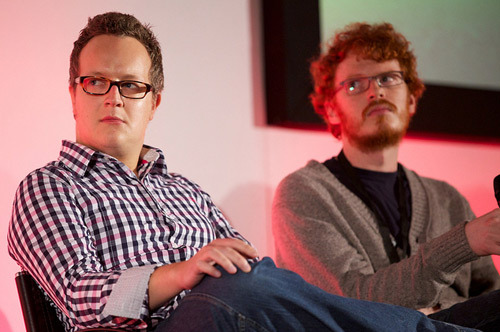 As a speaker and serial-attendee I get to see most of the inner workings at such events. I was under no illusion about the scale of the task (having organised a couple of big art festivals in the past), and as months went by I really enjoyed it. Sure, it got stressful as the event approached, and was kind of murder on the day, but a sort of enjoyable stressful murder nonetheless. All in all I’m proud as punch. In my opinion, the speakers really delivered. Each of them prepared something brand new, ambitious, challenging, and insightful. Although it was my responsibility to curate the programme, I let them do their thing. I never interfered with their ideas, and I always suggested they take this opportunity to try something new, to take a risk, and to enjoy themselves. I think each of them really embraced that, and the response from attendees was wonderful. If somebody didn’t like a particular talk, another declared it their favourite. In some cases, the substance of talks flowed from one into another. Ideas joined up, outcomes became cemented, and things flowed. Sure, maybe a couple of talks backfired in some eyes, but you have to try these things. An audience of over 600 is never going to be universally satisfied, but that generally positive majority have made me very happy indeed. Not once was there a piece of code on screen. Not once did any of the speakers preach about how we should be doing things, or not doing other things. ...attendees were very much treated as a hall full of fellow professionals, people on the same level as the speakers. There was an overwhelmingly gratifying feeling of assumed knowledge, and I absolutely loved that. Anthony, that is brilliant. That whole review really “gets” it, and I’m considering printing it off and having it mounted and framed in every room. Or at least in the bathroom. Throughout all of the talks I didn’t see one line of code. I don’t go to a conference to learn specifics and take diligent notes, I go to be influenced and inspired by industry leaders. Talks were time-boxed to just 30 minutes, meaning they were lean, focused, efficient and left me wanting more. 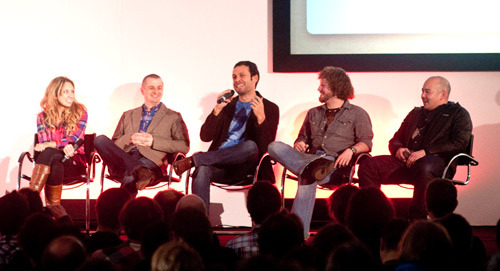 #naconf had the best community feel of any conference since [@]media 2005. @Colly just set a new standard for everyone to meet. 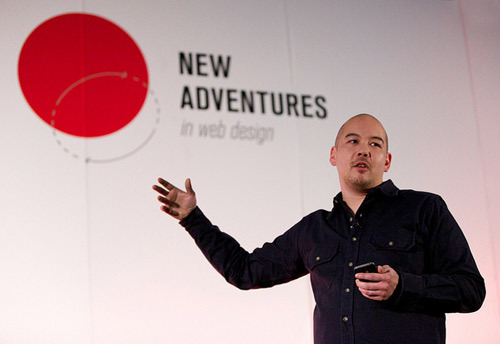 [New Adventures] had a profound effect on me as a designer - the topics discussed have helped me realise what I really want to specialise in. There was even a wonderful post from the perspective of a non-geek accompanying her geek husband, and numerous reviews of the presentations themselves, with most seeing the content as thoughtful, challenging, and unexpected — in a good way. This review from Robert Mills is one of many that explores the speakers’ messages in some detail, and this one from Phil Ricketts boils the talks down into key takeaways and outcomes. 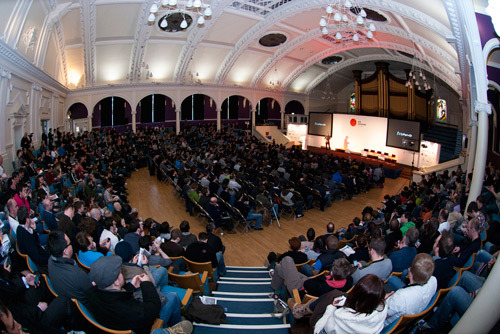 I could link to so many great posts about the event, but I’ve already tried to do that via the @naconf Twitter stream. Perhaps once all the feedback is in I’ll provide all the links in one great big overview. Naturally, it wasn’t all plain sailing. Numerous attendees have mentioned the uncomfortable seats in some areas, the small number of toilets, the horrible flavour of the Muller yogurts and so on. At one point we lost power on stage (did any of you notice?) and there were a couple of audio issues, plus a dark area of the stage where speakers would disappear into a black hole (as captured on the soon to be released videos). Still, how could it possibly all go to plan? I think most errors happened quietly, with the attendees unaware of the little stresses and unexpected strains. That said, we messed up registration a little. With hindsight, we didn’t have the greatest system in place to cope with the small foyer area, and we never expected so many people to turn up after 8.45am, which caused a terrifyingly large queue that stretched right back to the island. So, we decided to start thirty minutes late, making sure nobody missed anything, and naturally this impacted on the schedule, making my life hell for a while. Still, it was refreshing that so few complained about the late start or waiting in the cold, and the smart thinking of the volunteers had a lot to do with that. Next year, registration at the warmup events, methinks. The Q & A debates didn’t really work. The first was compromised due to the compressed schedule, and by the last debate everyone was tired. I wouldn’t even call them “debates”, as it was more a case of me frantically collating questions posed via Twitter all day and then reeling those off. If I approached someone to verbally ask their question, they refused. Whilst it was a good idea to let five speakers converse rather than facing questions alone, ultimately this idea doesn’t work in a hall full of 650 people. So, next time we may break it down into smaller groups, have breakout sessions with speakers, or try to find an alternative (online) space for subsequent debate. I do want to find a solution, as the dialogue must not stop when everyone goes home. It needs a forum (for want of a better word) to let the ideas and inspiration bubble and ultimately make a difference. I’m pretty sure the after-party went well. I think we had almost 450 people across two floors. It would take me twenty minutes to get to the toilet, and I had the same conversation 300 times until my voice completely gave out. I know the music was loud at times; the manager who I’d liaised with was absent, and the bar staff kept turning up the music despite my protestations. I think they thought I was just some sad old drunk who couldn’t hear himself think. Right now, my place looks like a warehouse. It’s boxes, bins, banners, more boxes, and two weeks worth of washing up. It’s tempting to spend my time evaluating all the incoming feedback, and editing the videos, but alas I must get back into real project work, catch up with client sites, and make decisions as to which special projects I’ll be taking on this year. In the background however, I’m thinking strategically about what happens next for New Adventures. It seems that many of you want me to do it all again, and even try different events and workshops. Well, I’m giving it some thought, somewhere in my tired lumpy brains. My warmest memory of this whole experience will be of incredible generosity. At every turn, people went beyond the call of duty. Suppliers threw stuff in for free or went out of their way to make things better. My oldest friends pulled out the stops to do what they could, week after week. People I don’t know bought domains, built aggregators, offered to do whatever we needed. Amazingly, when Paypal refused to give my £20,000 of my own money, I had offers of treble that via Twitter to make sure things went ahead. The speakers had a whip-round and paid to replace my car keys which went missing at the venue. My Mam even spent days cutting up stickers and bagging up goodies until her arthritic fingers ached and her back hurt so much she couldn’t carry on. Honestly, some days I lose faith in human nature, but most days throughout this project I’ve nearly cried with thanks at how incredible and selfless people can be. So, I’d like to thank numerous people who made this thing possible. Our incredibly generous speakers, contributors, sponsors, and volunteers. The Albert Hall staff and the caterers, Nottingham Audio Visual, Lanyrd, Gowalla, Erskine Design, Second Wednesday, and Front. Individuals such as James Lindeman, Anthony Killeen, Joff + Ollie, Relly Annett-Baker, James Willock, Greg Wood, Nate Croft, and Emma Crosby. Venues such as Escucha, Saltwater Restaurant, and AMF Bowling. Inspiring friends at Brooklyn Beta, DIBI, EECI, HD Live, Interlink & Build. I’ve probably forgotten someone and now they’re crying. Oh, and the Australia-based Englishman I’ve never met who lent me twenty grand. Last but not least, every single attendee.